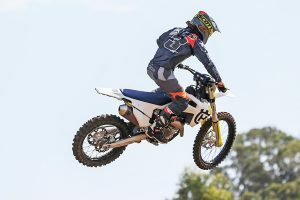 MotoOnline.com.au tests the 2019 KTM 125 SX, 150 SX and 250 SX. 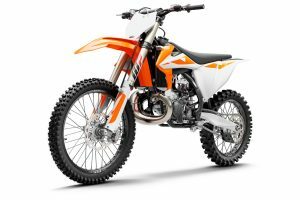 With the evolution on the four-stroke, there are very few manufactures still investing the time and money to develop two-stroke models – this is not the case for KTM though, who is still very passionate about its two-strokes and understands there is still a strong market to be captured here. KTM offers an incomparable range of two-stroke bikes, from 50cc through to 250cc in its SX range, although it’s the 125 SX, 150 SX and 250 SX that received the most attention for 2019 with a vast amount of updates to ensure they maintain the top step of two-stroke performance across the globe. Pista Malagrotta is the famous Italian test track of Tony Cairoli, located 30 minutes out of Rome. 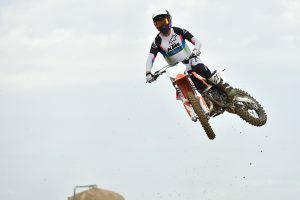 It was a short bus ride from the motel and KTM had access to the complex for the weekend and really put it on for us with completely prepared track and watering whenever required. The circuit is quite a technical track with undulation and surface changes, which proved to be a fantastic test track, and despite forecasted possible thunderstorms, we managed to scathe through with a couple of light showers that ended up providing optimal riding conditions all day long. There have been many upgrades in the two-stroke range for 2019, with all models receiving new exhaust systems that have been designed through KTM’s 3D stamping technology, delivering optimised shape and power delivery. The 125 SX has a new robust six-speed transmission from Pankl, which is extremely high quality and represents the best reliability. Along with the newly developed DS (diaphragm steel) clutch, it offers unbeatable reliability and due to its more compact design reduces the engine width by 10mm. It’s common knowledge that KTM hosts the most powerful and competitive engine in the class and is highly committed to staying at the forefront by using the most advanced engineering expertise KTM has to offer. Weighing in at 17.2kg, the 125 SX engine is not only the most powerful, but also the lightest, offering an exceptional power to weight ratio. Back in 2019 across all models is the 38mm MIKUNI carburettor that delivers a smooth controllable power delivery. The cylinder on the 125 SX and 150 SX features a newly reworked exhaust port that is now CNC milled to improve timing and interaction with the main power valve, along with the twin component cylinder head these engine packages deliver solid performance throughout the entire rev range. Unlike the 125 SX and 150 SX models, the 250 SX has the DDS clutch (damped diaphragm steel) developed in house at KTM – the design is to use a diaphragm spring instead of the conventional coil springs aimed at increasing traction while improving the life of the clutch. 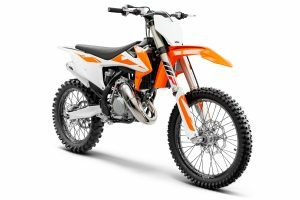 Equipped with the same carburettor as the smaller bore bikes, the 250 SX cylinder is 66.4mm and is fitted wit a sophisticated TVC power valve that allows you to optimise the power curve in a matter of seconds by using the two power valve springs that are supplied. 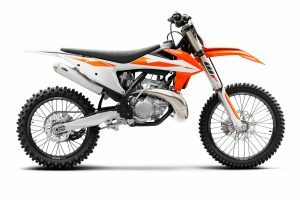 The vibration of the 250 SX has been taken into consideration in 2019 and it features a new balancer shaft and aluminium cylinder head braces to reduce vibration and improve rider comfort. The 125 SX was the first bike I rode for the day and early in the morning it was a little bit cold, so the bike was a little lean off the bottom which made it feel flat, but after a quick jetting change it brought it back to life. the 125 SX is such a fun bike to ride, although you have to keep your whit’s about you with the amount of gears you’re change after riding a 450 for the past five or so years. It loves to be kept high in the rpm and provides excellent mid to top end power for its size and you can see why it’s he class leader of all it’s competitors. 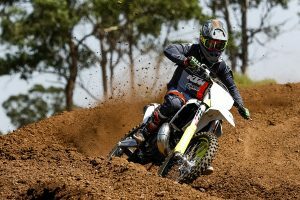 The 150 SX is simply a faster version of the 125SX, whilst I found it didn’t have significantly more bottom end than the 125 SX, it definitely had a whole lot more top end which I didn’t really expect. It just keeps revving for a little bike and doesn’t really sign off. It has a slightly stronger mid power curve compared to its little brother, which helps you get to the sweet spot of the power faster but you could ride around the track with the throttle in one position, completely wide open the whole time, the harder you rev it, the better it performs. Talk about hard hitting, the bottom end power delivery on the 250 SX is definitely not for the faint hearted. After riding the two small bores and hopping on this, I nearly rolled off the back when I hit the throttle for the first time – the bike punches seriously hard off the bottom but signs off quite early, it has enough torque to carry tall gears and you can feel the effort that has been put into reducing the vibration of this model. 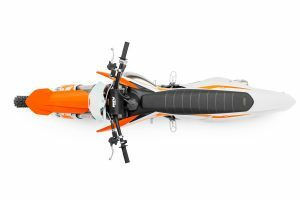 If you don’t necessarily enjoy such a powerful bottom end you can tame it down with the adjustable power valve which makes for a much smoother ride. 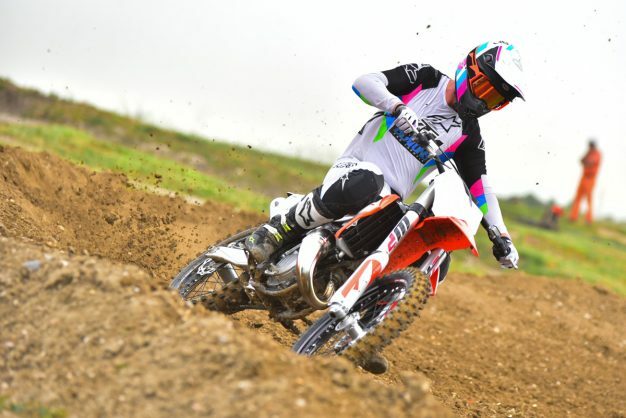 Just like the four-strokes, the pre-mix machines have all received the new chassis, which really improves the handling and stability of the new 2019 models. Still equipped with the WP AER 48mm air fork and DCC (duel compression control) shock absorber, there is more than enough adjustability to fine tune your ride to exactly the way you like. 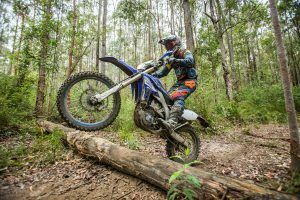 They all feature updated settings in the fork and shock which is another additional asset to the great handling of these bikes. 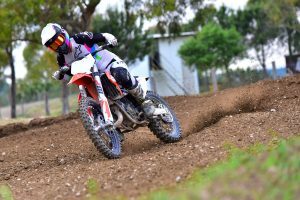 I felt that with the 125 SX and 150 SX they are so light and having no engine brake you can really get on top of the bumps coming into the turns, which greatly assists the ability to carry more momentum into and throughout the turns. And exiting the corners through the acceleration bumps proved to be no drama either with a great amount of traction to drive straight through the bumps with the real wheel maintaining traction the whole time. It was much the same with the 250 SX, however having additional rotating masses and more mumbo compared to the smaller bikes you had a little more urgency to pull up for the corners which forced the wheels lower into the bumps and took a little more to hold onto, and exiting the turns you had to be a little more careful on the throttle because if you hit it too hard it was easy enough to break traction. In saying this though it held up quite well for how hard you could ride into the turns. Across all the models I was really surprised at how consistent the bikes handled, every time you rode into rough parts of the track you knew exactly how the bike was going to react and having such a predictable feeling whether you were breaking or accelerating really provided confidence to try and turn out better laps every time you entered the track. 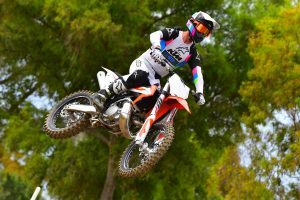 In summarising the three two-stroke models I think that is very evident that the amount of continuous development the goes into these bike really sets them apart from the competition – year after year they are consistently getting upgraded. 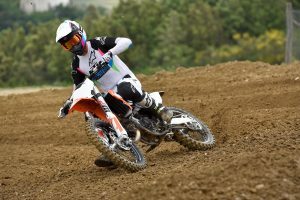 If you are looking for a race-winning two-stroke, it would take some serious consideration to walk past any one of these models being the lightest in each individual class and having the most amount of power to accompany them. With completely predictable handling and a wide range of chassis and engine adjustability, all three models are race-winning combinations.